What would you do? Sounds like something right out of an Amazing Race Detour scenario? Well I had a third choice – to admire the beautiful Auckland skyline right within the comfortable confines of the SkyDeck 220 metres above ground. There is also a fourth option which I shall elaborate later on in this post. Instead I opted for the SkyWalk which turned out to be the most scary 20 minutes I had ever experienced during this Auckland trip. My journey began at the basement of the Sky Tower where SkyWalkers and SkyJumpers underwent a quick safety briefing and a sobriety test with a breathalyzer – they wouldn’t want drunks going crazy off the top of the Sky Tower. The ground rules were laid out clearly – strictly no loose items e.g. cameras, watches allowed and all participants were scanned with a handheld metal detector to ensure this rule was observed. 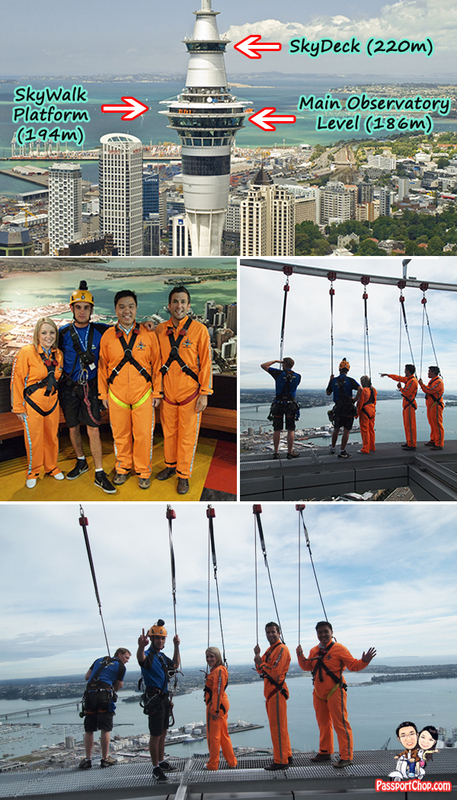 We were then suited up in bright orange jumpsuits with safety harness securely strapped in before we took the Sky Tower lift (which travelled at 18 kilometres per hour, taking us 186 metres up to the Main Observation Level within a quick 40 seconds). There are no handrails along this narrow walkway round the Sky Tower so the safety strap that latched onto a mobile guide-rail above our heads acted as our only psychological support. As if walking under such conditions (strong cold winds, narrow paths, no handrails) was not scary enough, our SkyWalk guide challenged us to various activities along the route – from leaning forwards and backwards over the ledge to walking forwards and backwards with your hands-off the safety strap and looking upwards at the same time. These activities are not mandatory – participants are still allowed to complete the SkyWalk without trying any of these but that would take the fun out of doing this walk. 🙂 Actually once you start doing these challenges with guidance from the SkyWalk guide, it is quite easy and safe – there is just no way you can fall off the edge as the safety straps are very strong and able to hold up your weight. If 11 seconds (by SkyJump) or 20 minutes (by SkyWalk) is insufficient for you to take in the beautiful marinas and city skyline of Auckland, all SkyJumpers and SkyWalkers are given a complimentary pass to the observation level of the Sky Tower (valid only on the day of the SkyJump/SkyWalk). Besides checking out the Auckland surroundings with the SkyScope which zooms in on key landmarks, visitors can also wine and dine at the Orbit Revolving Restaurant which serves unique ala carte New Zealand cuisine with stunning 360 degree views of Auckland. You can also enjoy the sumptuous brasserie-style buffet at the Observatory Buffet Restaurant – the only place where you can also check out other SkyWalkers in action and see their nervous faces as they tackle each challenges put forth by the guide. Adult Prices for SkyJump and SkyWalk are NZD$225 and NZD$145 respectively (as of 7 April 2011). There are discounts for Students/backpackers with valid ID and Family packages (2 Adults and 2 Students/Children). Check out SkyJump website and SkyWalk website for more information on opening hours and prices. 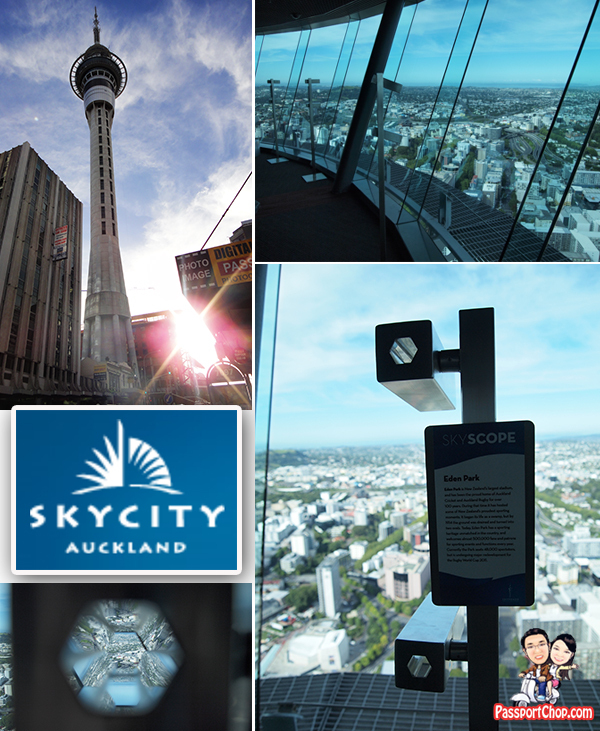 The Sky Tower is just a quick 2 minute walk from SkyCity Grand Hotel. Remember the fourth option I referred to besides SkyJump, SkyWalk or just staying within the comfort of the observation deck? – The more adventurous ones can also take on the Look and Leap – a special value for money package of both SkyWalk and SkyJump for just NZD$290 – just top up only NZD$65 if you had just done a SkyJump. OMG! You’re awesome. How did you manage it?? After watching the video I’m getting dazzles. I know it’s a great thrilling experiece and you won’t forget during whole life and won’t hesitate to tell your children and even grand children.